B.J. Novack is the next person casted in Inglorious Bastards! The Office regular is in talks to play Sgt. Donnie Utivich, a Jewish-American Nazi killer of slight build who hails from New York city. 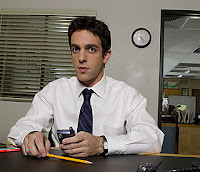 Novack, who has done been great to date on The Office and should be a good addition to QT's Inglorious Bastards. Eli Roth and Brad Pitt have been the only other cast members named and production is set to start in fall in Europe. Inglorious Bastards is being produced by Universal and co-financed by the Weinstein Co. Thoughts on the most recent additon to Inglorious Bastards? Do you watch The Office? Does it seem like Pitt will be the only star of the feature? Will QT add any other big names to the cast?